When you talk to people about the future of Timba, they are often pessimistic saying things like "There is no market for the music outside Cuba, so the artists have to play other genres to survive". Well Calle Real think there is a market for Timba. In fact this band started out in 1999 as a trio playing classic son á la Buena Vista Social Club and over a period of 7 years has developed into one of Europe's most interesting Timba bands. They choose to create the music they want to hear, rather than taking the easier path of catering to the established markets. As Patricio Sobrado, band leader for Calle Real says, "Our drive is purely egotistic, to put out our own music. We love and enjoy listening to it. The rest of the consequences are only bonus." And what has the result been so far? No, they are not millionaires, but despite being an unestablished band, they have made ripples in the salsa world in Europe. In 2004 they began recording a demo of what would later become their debut album, Con Fuerza . DJs in France and Italy began playing the demo and Calle Real quickly reached the top of the DJs' playlists. In the US their first single reached 52 on the Latin charts. In the Spring of 2006 they finally released their first CD, Con Fuerza . 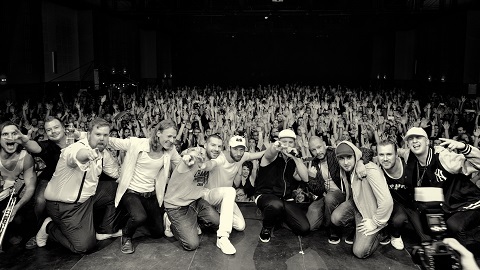 One interesting development with Calle Real is the fact that in Sweden their audience is not limited to salseros; they have also developed a following among the hip hop population. This sort of proves my contention that the potential audience for Timba is greater than that of "regular salsa" as timba is more experimental and includes many more modern influences that have an appeal to the younger generation raised on hip hop, rap and R&B. Another thing I like about the group is that they only perform original material. If you buy their CD or go to one of their concerts you will not hear yet another version of La Cuarta de Tula or La Vida es un Carnaval. Their plan is not to sort of "ease" into playing timba one album at a time, but come out fighting with no apologies. While the music they create is Timba, their sound also reflects the diverse musical influences of their European background. Calle Real are not interested in trying to imitate the great Cuban bands. Instead Timba is the base, but they bring something of their own to the mix, something fresh. They describe it as pop, but I would lean more towards calling it rock, with a heavy groove or swing that runs through all their songs. The band members themselves seem not to be in complete agreement as to the extent to which Calle Real have already achieved their own sello. But when talking about their music Patricio says "Of course we are influenced by Charanga Habanera, Michel Maza, Pupy, Los Van Van, Paulito, Manolito, Manolín and the likes since we like to listen to them, but being raised over here we have other influences as well. We are glad people think we play Timba 'cause that's one of our influences we respect, but ...our sound comes from having a need to express ourselves musically, and we use the Cuban music style to do it. We will probably never sound like a Cuban band and vice-versa; a Cuban band will never sound like us". I'm going to enjoy watching Calle Real as they make their official entrance to the world of Timba with Con Fuerza . I hope they can continue their success at widening the timba audience throughout Europe and the United States, and I recommend that promoters take a page from Calle Real's book and look for ways of reaching new potential audiences by thinking outside the box. There's more to Timba than just salsa, and Calle Real know it. See also Calle Real's official website their MySpace page and Facebook fan page.